Late last year, the New York Times sent its Sunday subscribers a magical cardboard box that opened a window into the lives of three young refugees: 11-year-old Oleg from Eastern Ukraine; 12-year-old Hana, a Syrian living in Lebanon; and 9-year-old Chuol, who is in hiding in South Sudan. The box, a virtual reality viewer that turned my iPhone into an immersive TV, let me watch Oleg play among the rubble of his village, follow Hana through cucumber fields as she and her cousins worked as day pickers, and ride in Chuol’s narrow canoe as he navigated swamps to an secluded island where his grandmother and he have been hiding. Across the globe, nearly 60 million people are currently displaced — forced to leave their home by war or persecution. Some 30 million are children — roughly the populations of New England and New York combined. In recent years, the U.S. has taken in more than 150,000 school-age children fleeing some 110 countries. In my classroom, nearly all of my roughly 100 students have fled something. They have left behind gang-dominated neighborhoods, overcrowded refugee camps, and, in some cases, brutal wars. Many have come with their parents; others have come to live with relatives; a few have made the journey alone. I know very little about the individual voyages that have brought them to my history classroom in Massachusetts. The students act like most teenagers — they gossip about crushes, snap endless selfies, and occasionally forget to study for tests. I can only guess how their stories might resemble Oleg’s, Hana’s, and Chuol’s. Between lessons on American industrialism or the movement West, I hear snippets of stories — about years spent in refugee camps or homes abandoned to war. While I don’t know their individual stories, I do know two important things. First, displaced children faced enormous educational challenges before they arrived in our U.S. classrooms. Last year, as a graduate student in Sarah Dryden-Peterson’s class at Harvard, I heard from aid workers and refugees about overcrowded classrooms with as many as 70 students per teacher; minimal teacher training; nearly no inquiry-based instruction; frequent disruptions; little consistency in the language of instruction, with students struggling to master a new language rather than academic content; and rampant discrimination. It is no wonder that these students’ transition to American classrooms might be rough. Second, for refugee children, even small connections with their homelands can go a long way. Early in the semester, two young students from Cambodia were surprised to find out that I knew about their country and had even spent several months living in Phnom Penh. A month later, a girl was flabbergasted that I could identify her West African homeland on a map. Several weeks ago, two of my Burmese students asked if I had seen the news about the electoral triumph of Aung San Suu Kyi, the Nobel Prize winner and politician. They seemed pleased to learn I had. Such exchanges are small, but they seem to make an impact. Our students work every day to master English, understand American customs, and navigate American cities — on top of negotiating the considerable complexities of being a teenager and a student. By learning a bit about their countries, cultures, and histories, we as teachers can send a powerful message — that we care about the lives they left behind, that we think their history is important. Knowing all of this can help me support my students in the classroom. Yet I still wonder about their stories, and whether I should provide opportunities for them to speak, to write, and to share their experiences. 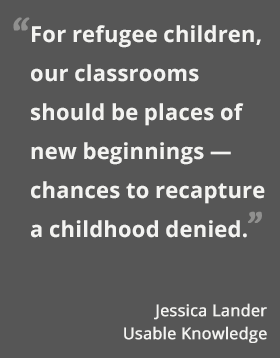 Our classrooms should be places of new beginnings — chances to recapture a childhood denied. But some of our students might be grasping for a way to process their pasts and to share their experiences, even as they immerse themselves in new possibilities. As teachers, we should be working to create those kinds of safe spaces — for our students to speak and for our students to listen and understand. If we can do it right, I believe that our classrooms can help students find the balance they need — between acknowledging the past and constructing a future. Creating such a classroom is my aspiration, even if — like so many of my students — I am not yet always sure of the footing. Read Sarah Dryden-Peterson’s report on the experiences of refugee children, written for the Migration Policy Institute. Read a Usable Knowledge summary of the report. In a new blog series, a young teacher chronicles the journey from research to practice. Making family engagement a priority — one batch of cookies at a time. Why student teamwork is important, and how teachers can build a game plan. What happens when you push a writing assignment past the first (and second) draft?